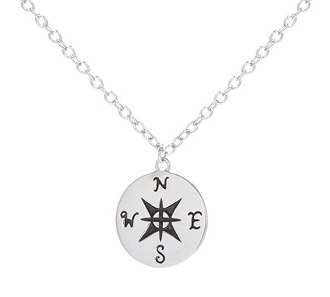 Never lose direction with this Nautical Compass Pendant Necklace. The compass is a symbol of guidance, having the ability to point you in the right direction, allowing you to take pride in the path you have chosen. Etched into the silver pendant you can see the “North, South, East, West abbreviations and compass details. The pendant hangs from a sterling silver link chain that has an adjustable length of 16” - 18” allowing you to wear it however you desire.